The last day of winter was bright, sunny and warm heading for ~20°C in the afternoon. Let us hope that it continues through the spring and into summer. It was announced by Paul Brecknell, who knows about these things, that spring had officially arrived since a migrant avian visitor, a warbler of some kind, was heard warbling away in the hedge behind the hall. After my long, but otherwise easy journey, I too knew how the bird felt on arrival at Bagington village hall! Having missed the October meeting, it has been a year since my last attendance and I can report that on arrival the hall was buzzing with activity as always. However, a few regular attendees were conspicuous by their absence, sadly permanently in some cases. The better news is that a sprinkling of enthusiastic new members and a few guests ensured that there was plenty for me to do in the reporting department. As always, my apologies to those I have misrepresented or overlooked in some way. First on my personal tour was a group of three small models by our Chairman George Illingworth. In his, approximately 1:12 scale, fire engine series of instruction manual models was a 1909 Merryweather Motor Pump, very nicely presented in a careful mix of pristine red and zinc coloured parts. His second model, also to 1:12 scale, was a 1956 Dennis F23 break down lorry constructed in the appropriate period red and green colour scheme. George informed us that the prototype for this model was a unique one-off of the type. Lastly, and having been given a well used collection of blue and gold Meccano, George presented his version of the fire engine model described in the early post war No.8 outfit manual constructed from the blue and gold collection of parts. He then went on to explain that this completes his marathon programme to build every single fire engine model described in the Meccano instruction manuals from the beginning of time. 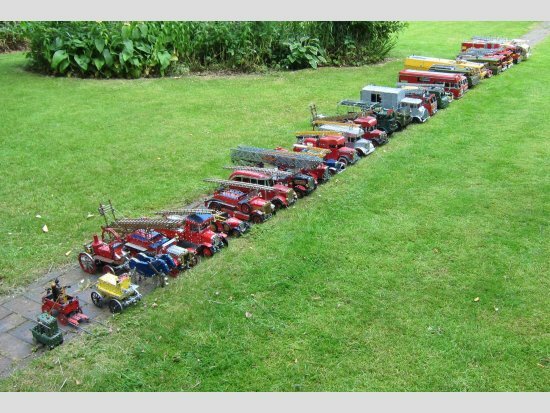 George now has a collection of 50 fire engine models, all built to an approximate scale of 1:12, and pretty much representative of the history of the development of the fire engine. Tucked in alongside George’s models was a little lorry mounted crane built from the current Revolution Set Truck Crane by Ken Wright. This model is about 14” long and looks extremely attractive in its black and yellow colour scheme and exhibits a good level of mechanical detail. Needless to say it was carefully assembled by Ken with the appropriate attention to detail in its construction. Next was “several yards” of mint 1970’s No.9 outfits in their wooden cases and brought along by Richard Payn. Four sets in total, all in the yellow and dark blue colour scheme and some of which still have shrink wrapped contents. 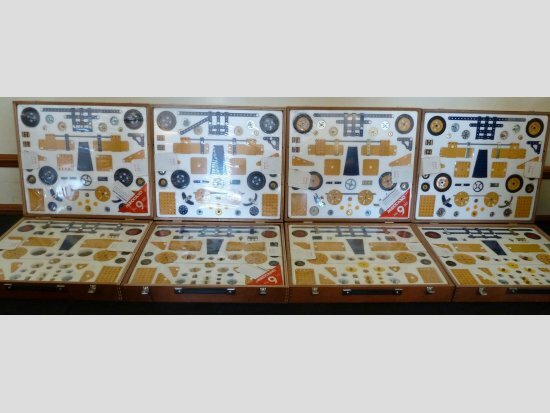 It was pointed out that although these sets were all issued within a two year period, the purists were kept busy spotting the minor differences between the contents and the layout of parts within the box. 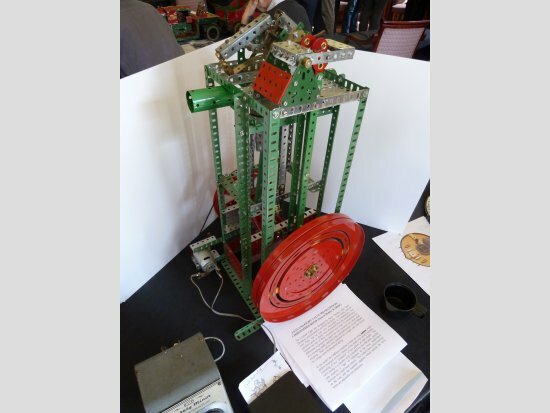 This was a really eye catching display, with a fairly high nostalgia coefficient for the Meccano historians amongst our members. Next door was an even more eye catching display of pre-war Aeroplane Constructor outfits and models from the collection of Roger Marriott. The display comprised several boxed outfits showing various colour schemes of strung parts together with several built up examples of aeroplane models. 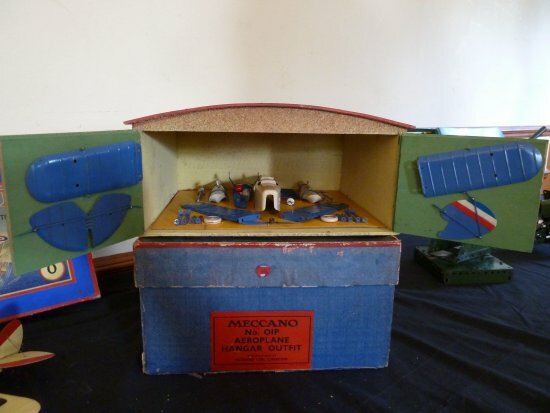 Of particular interest was, not one, but two contemporary Meccano hangars complete with their packing boxes. These are rare items indeed, but the rarest of the two included the strung contents of one of the smaller aeroplane outfits as well. Centre piece of Roger’s collection was a restored dealer display model in the form of a rotating tower with four radial arms at the top from each of which was suspended an aeroplane model. The base and rotating tower was constructed using blue and gold parts whereas the aircraft models showed four different, but equally attractive colour schemes of the period. I don’t think I have ever seen so much Aeroplane Constructor nostalgia collected together in the same place – quite a show! And there was even more nostalgia alongside brought to the meeting by Tom and Matthew McCallum. Their display was centred on the pre-war Mechanised Army outfit No.MA. The outfit was shown strung in its box together with instruction manual and several examples of built up models to illustrate the capability of the outfit. 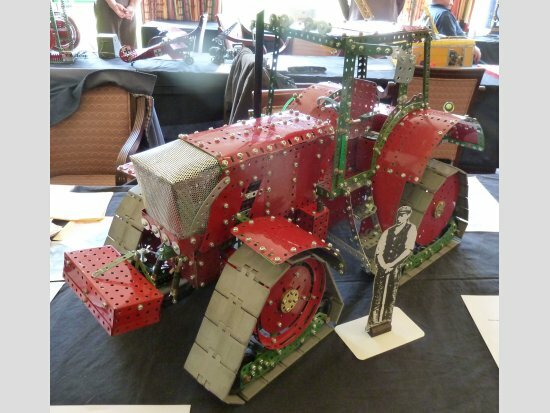 The display was completed with an example of Meccano advertising compatible with the period of the Mechanised Army outfit. Brian Edward’s usually brings a new model to every meeting. His models are consistent in as much as they are original designs, they are built to a high standard using mid 1950’s red and green parts and they are usually of a manageable size. 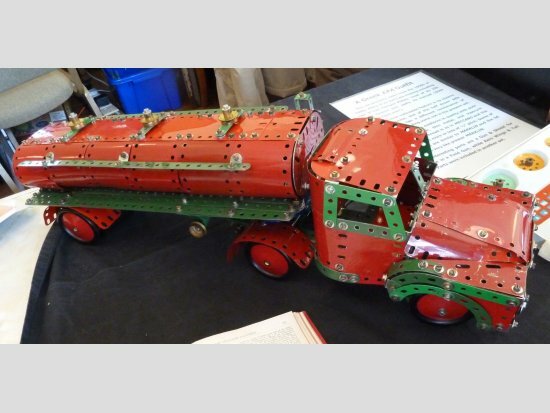 On this occasion his model was of a 1960’s Scammell Highwayman Heavy Tractor pulling a large flat bed machinery trailer. To add interest, the trailer load was his model of a 1929 Sentinel vertical boiler, twin cylinder, 3ft 6” gauge steam locomotive. 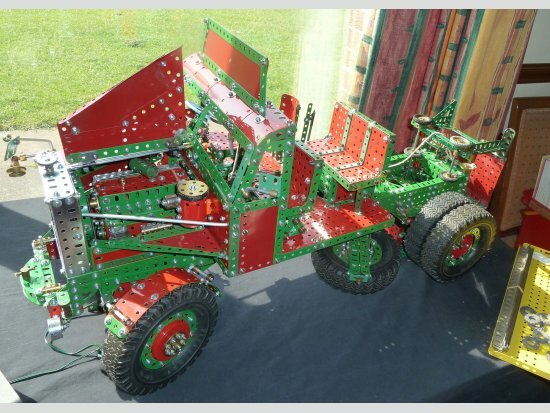 Built to a scale of approximately 1:10 the overall length of the tractor with trailer is about 3ft 6”. Brian informs us that the prototypes for the models were all used by the London Brick Company. In contrast, Sid Beckett was travelling light on this day having brought along his compact model of the Meccanograph built to the design of Eric Baldwin. 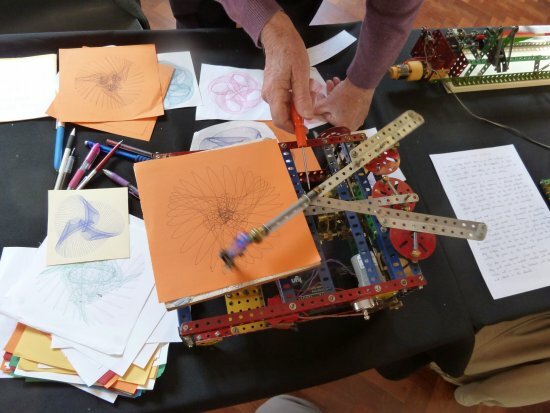 Although fairly familiar in appearance Sid’s Meccanograph is capable of serious work if the vast number of example patterns is anything to go by. The machine produces new patterns at a fairly rapid rate and the amazing number of variations in pattern is very impressive. A great way of keeping the crowds interested! Like Brian Edwards, Geoff Devlin also brings a new model to every meeting. His models are also consistent since they are original designs, they are built to a high standard using mid 1950’s red and green parts and they are typically the kind of construction associated with the classical No.10 outfit. His model was of a modern Fendt 936 Vario Tractor fitted with Soucy tracks. The prototype is a powerful diesel agricultural tractor manufactured in Germany. Particular features highlighted by Geoff include; electrically controlled mechanical/hydraulic systems, one lever to control forward and reverse travel, and automatic cruise control. This particular model has the unusual arrangement of being fitted with Soucy rubber tracks in place of conventional wheels, it has 4×4 power transmission and normal front wheel steering. The Soucy rubber track system is made in Canada and its benefits are quoted; “A modern retrofit track system which allows farmers operating mid size tractors to get the benefits of reduced ground pressure and high level traction without creating a bulkier, less manoeuvrable machine.” The model is built to an approximate scale of 1:8 giving it a length of 27”, width 15” and height 17”. Nicely made as ever and worth close inspection if you get the chance. 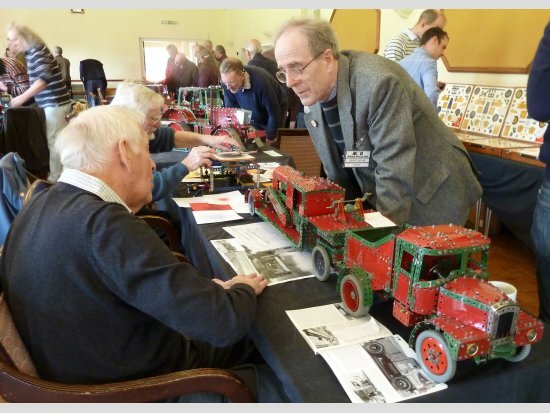 Michael Bent brought along his original design model of a 1901 Leyland Tower Platform lorry. The prototype is a simple early lorry with a vertically extending tower construction mounted behind the cab, and the extending section is surmounted by a small flat service platform. Extension of the tower is by means of a cable and pulley arrangement. The prototype was used for servicing overhead cables, etc and Michael developed his design from the original vehicle which is in the Leicester Museum. The model is what I would call about No.8 outfit size, it is nicely constructed using mid 1950’s red and green parts and basic travelling motion is by means of an E20 electric motor. The model is a convenient size with approximate statistics; 24” long by 8½” wide by 18” high. 2014 being the centenary of the start of WWI, John Reid had created the most imaginative Meccano diorama of the front line to remind us all of the primitive horrors of that war. The diorama comprised an SE5A biplane, a 6” Howitzer artillery piece and a model of a section of front line trench, all carefully built to an approximate scale of 1:20. The SE5A was introduced into the Royal Flying Corps in March 1917. It was the mount of many of the Allied Aces including Billy Bishop, Edward Mannock, James McCudden and Albert Ball, and they flew from aerodromes situated some miles behind the lines. The model is based on the contents of an Aeroplane Constructor Outfit, which was last produced about 70 years ago. John tells us that the rear fuselage decking in white is not quite right and will be replaced with a red example when he can find one at the right price. The Howitzer model is derived from the special instruction leaflet SML 6.47 with redesigned and improved firing mechanism, wheel brakes and wheel "girdles" to assist in manoeuvring the gun in muddy conditions. The Artillery Batteries which included Howitzers and other artillery pieces were situated some distance to the rear of the front line trench system. The centre piece of John’s display was his model of a section of front line fire trench, measuring about 3ft wide by about 18” deep. Modelled mainly in dark red and green colours, it was populated with many soldiers, with rifles and equipment, and also a few fat rats, represented by couplings with string tails! John’s description of the model follows: Front line trenches were usually about seven feet deep and six feet wide. The front of the trench was known as the parapet. The top two or three feet of the parapet and the parados (the rear side of the trench) consisted of sandbags to absorb any bullets or shell fragments. In a trench of this depth it was impossible to see over the top, so a two or three-foot ledge known as a fire-step, was added. Trenches were not dug in straight lines, otherwise, if the enemy got into your trenches, he could shoot straight along the line. Each trench was dug with alternate fire bays and traverses. Duck boards were placed at the bottom of the trenches to protect soldiers from problems such as trench foot. Soldiers also made dugouts and funk holes in the side of the trenches to give them some protection from the weather and enemy fire. The front line trenches were also protected by barbed wire entanglements and machine gun posts. Short trenches called saps were dug from the front-trench forward into no mans land. The sap-heads, usually about 30 yards forward of the front-line, were used as listening posts. Behind the front line trenches were support and reserve trenches. The three rows of trenches covered between 200 and 500 yards of ground. Communication trenches were dug at an angle to the frontline trench and were used to transport men, equipment and food supplies. Roy Whitehouse brought along several small models of aircraft propeller mechanisms, dating from the WWII period. The first, and perhaps the most interesting model was of a working variable pitch mechanism based on an illustrated article in The Aeroplane magazine for June 1941. The model incorporated a planetary gearing system through which propeller blade pitch could be adjusted from a lever in the cockpit. 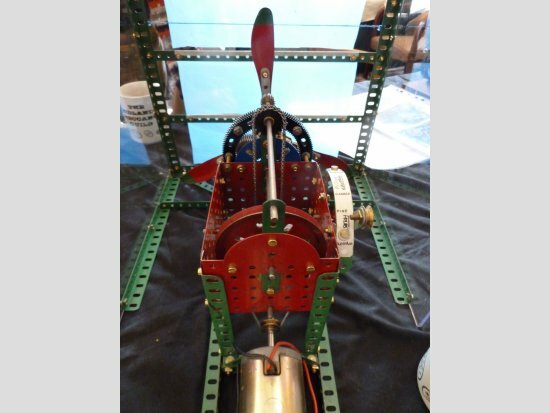 His second model showed a simple reduction gear arrangement for use with a radial engine and his third model showed a contra-rotating propeller drive system. Although quite simple, both of these models could be set in motion by turning a handle. As an aeronautical engineer, this little collection appealed to me a lot. Alongside was a very nice model of a 1920 Foden steam wagon brought along by Dave Phillips. The overall length of the model was about 18”, to give some idea of its size, and it was set up on a display board for working demonstration. The model is notable for its careful construction using pristine red and green parts from the 1950’s. However, even more notable is the fact that Dave had reclaimed and restored all the parts from pretty shabby Meccano picked up from here and there over a period of time. It shows just what can be achieved given the time and enthusiasm. Roger Burton brought along two unusual models. Roger’s local church has a side entrance which is used occasionally for the congregation to leave when the main entrance is temporarily blocked with other activities, such as a wedding, for example. However, the side entrance is narrow and opens directly on to a stone flag bridging a drainage channel adjacent to the church wall. The church authorities wish to install safety railings either side of the stone flag such that they are not fixed to the church wall, do not require planning permission and are removable when not required. Roger and his friend were invited to take on the design challenge and, following approval, to install the railings. 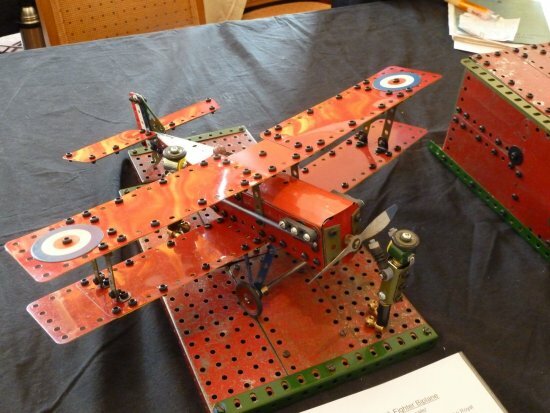 The first of his little Meccano models was built to demonstrate their solution. Colour coding was used to enhance the information – yellow parts represented the church wall, doorway, drainage channel and flag stone bridge. Green parts were used to portray the grassy areas. The simple solution to the problem was for the removable railings to plug into sockets securely attached the ground, thereby easily meeting the requirement. 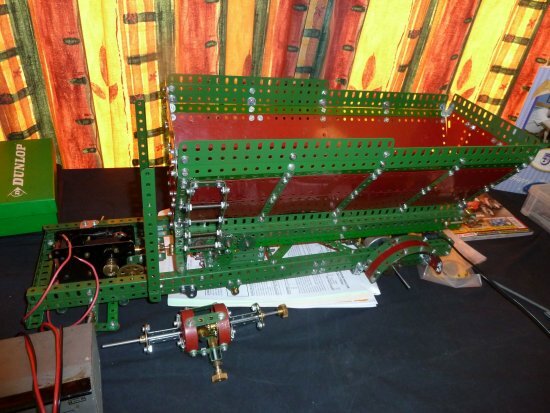 Roger’s second model was of a small printing machine inspired by a similar model demonstrated by Jim Gamble to the South Birmingham Meccano Club. Those interested in the model will find building instructions in MM for October 1955. Then I came to an area crowded out with a striking assortment of red and green vehicle models. What may well be a first was a model of a modern wheelie bin refuse collecting lorry, together with a couple of wheelie bins. This model was carefully built by Tony Wakefield with considerable attention to detail, especially the bin emptying mechanism at the rear of the model. The model was of a good size, measuring about 36” long by about 15” high by about 12” wide, and was constructed mainly in mid 1950’s red and green coloured parts. To give you an idea of size, the wheelie bins were about 5½” high and their lids were represented by 2½” square flat plates. In my opinion, it would be nice to see this model written up in the Model Plan series of building instructions. The next pair of models alongside were built by our President Geoff Wright. Since it is well known that Geoff likes modelling public transport vehicles, it came as no surprise to find that his models were a tram and a sightseeing bus. His model of a UCC “Feltham” class tramcar was representative of a type used in London from 1933 until 1951. The model was nicely constructed, using mid 1950’s red and green parts, to a scale of 1:16. The model is about 27” long and runs on 3½” gauge track, and Geoff struggled to construct the model from the parts content of a 1950’s No.9 outfit. The model does not have as many featured details as Geoff would have liked since there were simply insufficient parts left and every single nut and bolt had been used. Geoff’s second model was really work in progress, a part built London Transport “Interstation C” bus. This model too is being built within the constraints of the No.9 outfit and after a bit of “jerry wangling” Geoff has managed to achieve a practical 1:14 scale – this enables the use of 2” pulleys with tyres to model the main wheels. Late in the day Geoff managed to obtain considerably detailed information on the prototype and as a result he hopes to include a high level of detail in the model. So watch this space! Dwarfing Ken Senar’s models was a large model of a Volkswagen T25 vehicle built by Dave Bradley. In typical style the model is quite large, about 2ft long, and is fitted out with standard radio control equipment. Dave likes to drive his models around, but I did not see his model working on this occasion. The VW T25 is an “estate” style vehicle and as per usual Dave had modelled the vehicle using yellow, blue and zinc coloured parts. Then I nearly missed some initial component constructions for a new crane model that John Hornsby is working on. Early indications were that this will be a mechanically interesting model in the fullness of time. Moving on I came to the industrious Paul Hubbard who was just starting work on a large new construction which I was informed would eventually become a model of a dredger. Paul’s other models included a large fairground swing boat ride, measuring about 2ft long, 10” wide by 20” high, and a lift based on SML 31. The swing boat ride, built to Paul’s own design, is interesting as it is set up for manual actuation with small people in mind. Small hands can turn the handle to put the model into motion with little chance of damaging either themselves or the model. 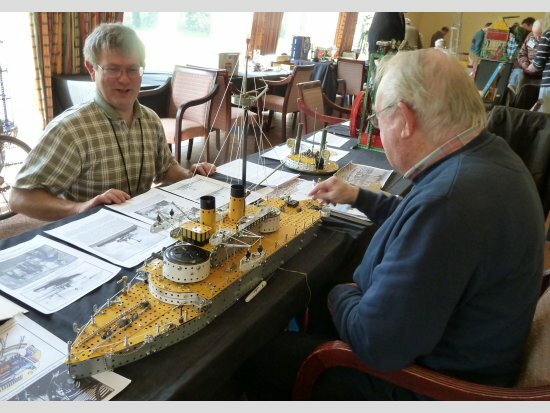 John Rix might be a newish member, but he is clearly an accomplished model builder. 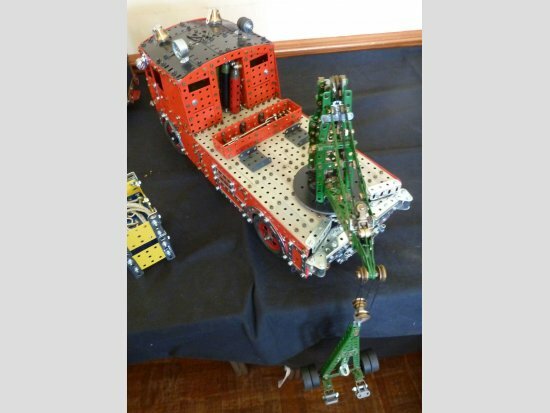 The model he brought to the meeting was the New Meccano Model as described in MM for September 1955 – The Articulated Tank Lorry. This fine model was carefully constructed using pristine light red and green parts, which started to appear around that time. In the “flesh” this is a very attractive model. Once again Tony Knowles brought along an outfit and model representative of alternative contemporary construction systems. Ever heard of a Greek EPA Outfit? No – neither had I! Tony brought along a nice example of such an outfit attractively presented in a two tray box, much in the style of larger Meccano outfits. His description will bring it to life: This set probably dates from the 1950’s or 1960’s. 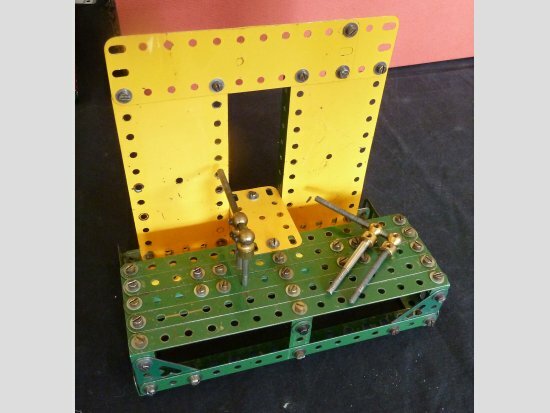 Many parts are missing including two 5×11 hole flanged plates, most of its 25 hole girders and, sadly, its manual. EPA’s most notable feature is its bizarre colour scheme, and of the half dozen sets seen, each has a different combination of colours, including some colours not in the present set. The parts are mediocre in quality with poor detailed design, thin metal, and insecure bosses. The thread is the same as Meccano (5/32” Whitworth) and the holes are at more or less ½” pitch. Some of the parts are similar to Märklin and the lid label is very like pre-war Märklin. 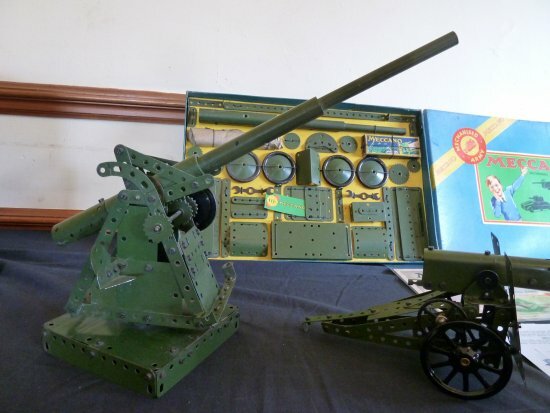 Interesting parts are a gun and shield for use in a field gun, while aeroplane wings and tail parts were included with another set. Tony’s alternative model was a French Trix marine diesel engine, a nice looking model dating from the 1950’s and based on a Trix shop demonstration model. Unusually the strips are coloured light blue or red, which gave the model a colourful appearance. 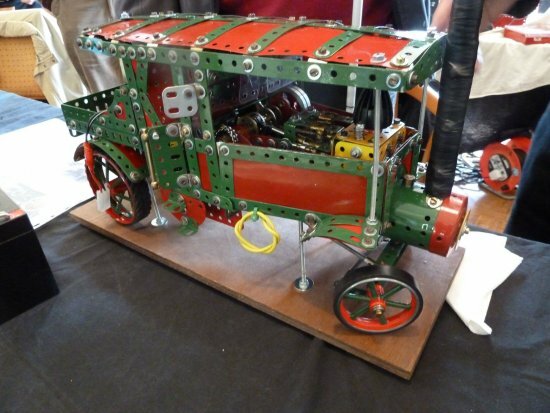 The model was set up for display and seen running, driven by an unusual French 110v motor. 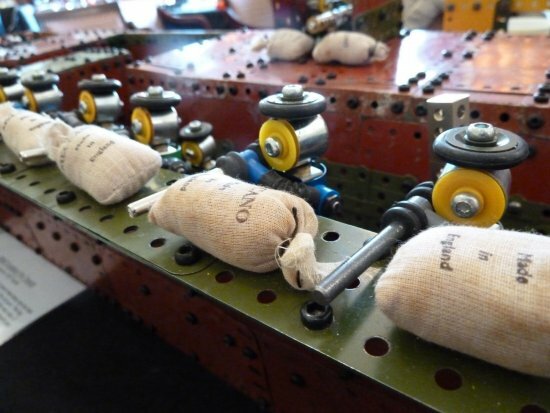 Although the model was running very smoothly, it is curious that the piston rods were represented by screwed rods – presumably suitably “smooth” rods are not available within the system. Tony also explained that the manual description of the model is unsatisfactory as no lower guides for the piston rods are shown! 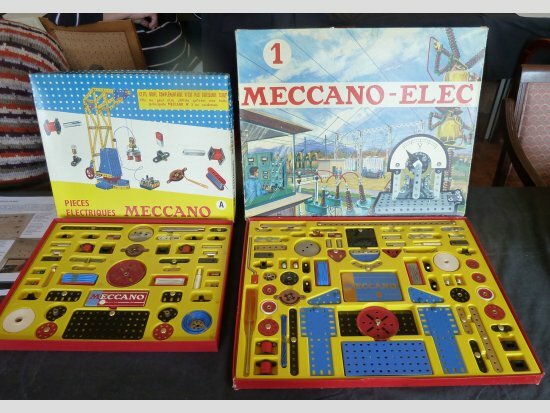 Richard Gilbert, on the other hand, brought along some interesting examples of the Meccano Elektrikit dating from the early 1960’s. 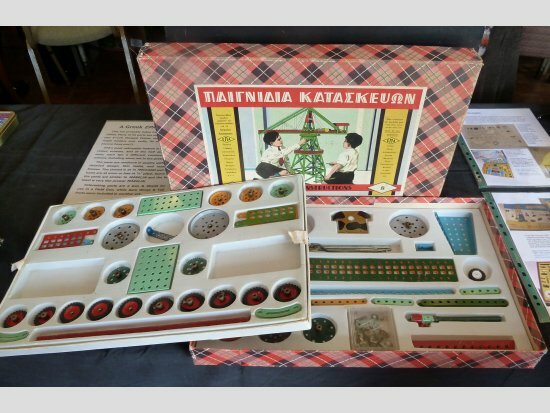 The first such item was a boxed and strung French electrical outfit dating from 1963 which looked very nice in its unused condition. The second outfit was also mint and was representative of the French “Meccano(FR) Pieces Electriques A” outfit. A small boxed electrical outfit, being otherwise equivalent to the Liverpool Elektrikit A outfit dating from about 1970. 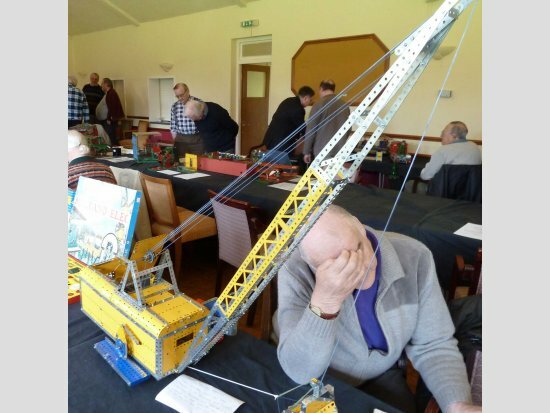 The Giant Walking Dragline next to Richard’s display was built by Terry Wilkes and with which he is not too impressed. The model building instructions may be found in the 1960’s No.9 outfit manual and Terry built the model as described in yellow, blue and zinc coloured parts. He chose to use a PDU to motivate the model, but it appears that this may not be man enough for the job. 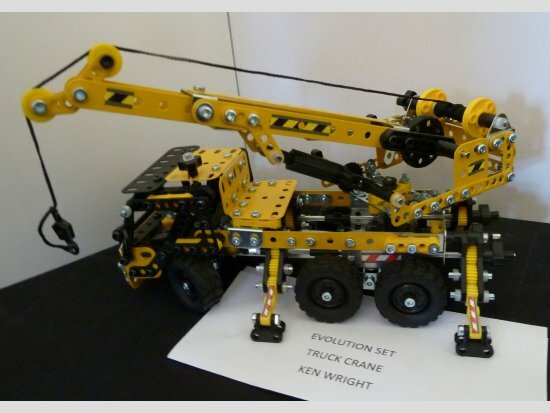 It seems that Terry was not entirely happy with the mechanical detail of the model – a common complaint among Meccano enthusiasts building from Meccano instruction manuals. Otherwise, the model looked nice in every respect. Then I came upon an assortment of models constructed by three guests from the Bristol area who were brought along to the meeting by Phillip Drew. It was nice to see Phillip again after what I believe has been quite a long absence. 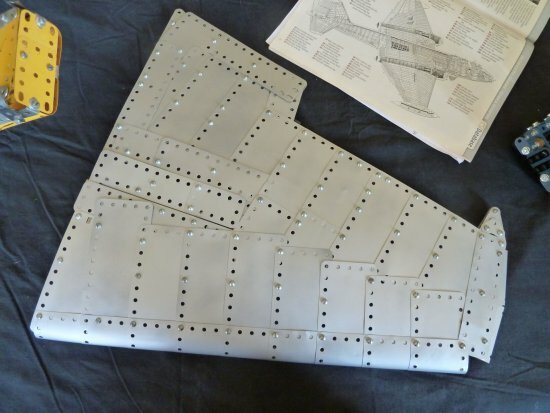 Richard Smith brought along a very carefully constructed wing panel for a Canberra aircraft model – yet to be completed. The wing panel has a root chord of about 20” corresponding with a semi-span of about 20”. Maximum thickness of the wing is about 1” and it is constructed mainly from carefully shaped flexible plates sprayed with silver paint overall. At this stage of construction it was possible to appreciate the internal construction and the mechanical provision for the flap and aileron. This is most definitely a model to look out for in the future. The next model was a very small, nicely constructed and presented recovery crane built by Neil Bedford. The prototype was a version of the AEC Matador configured for use by the RAF. Accordingly, Neil had sprayed the parts an RAF grey colour to create a good looking model which was unmistakeably a Matador in appearance. A credit to its builder, it shows that even small models can be most successful. The last model of the assortment was a similarly diminutive version of the Fokker DR1 triplane constructed by Peter Evans. 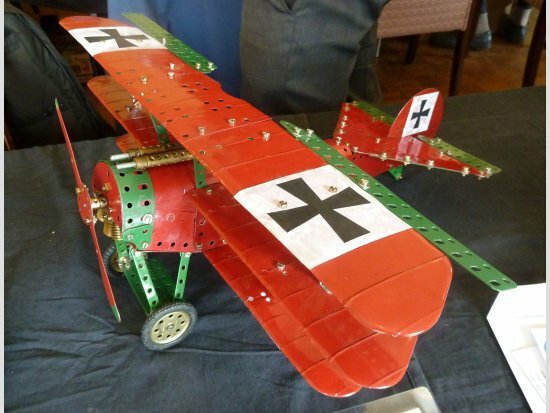 The model was most carefully put together to emulate the version used by the Red Baron. Peter contrived to use red Aeroplane Constructor parts supplemented with standard red parts to create his very convincing model. I do hope these guests will be persuaded to become members and that we will see further examples of their undoubted modelling skills in the future. 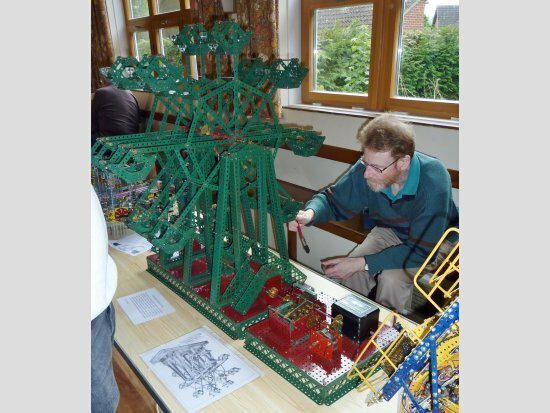 Christopher Bond often turns up with unusual models of complex mechanical constructions and, true to form he brought along a most interesting example to the meeting. 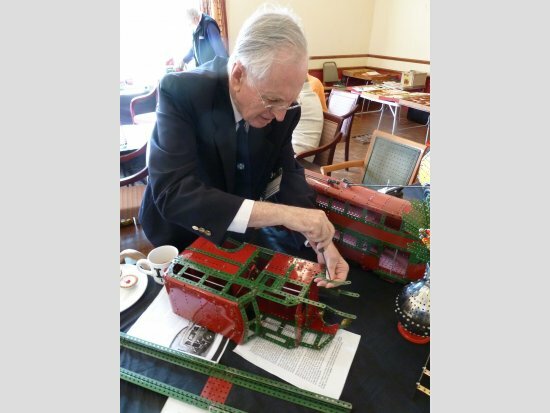 The model was designed and built to demonstrate the Leyland eight valve mechanism and has, in fact, had outings to both Henley and the South Birmingham Meccano Club in the past. The mechanism was designed by Parry Thomas, the Leyland Chief Designer, for incorporation into motor car engines and was intended to “out-Rolls” the Rolls-Royce. Since the mechanism was costly to make, only 18 were ever made. For quietness gears or chains were eliminated from the camshaft drive. Instead, two sets of three eccentrics were used. To compensate for differential expansion in the hot engine the upper set were mounted on a short shaft in a swinging cradle, and drove the camshaft proper via an Oldham coupling. Both inlet and exhaust valves on each cylinder were operated by a single cam, and closed by a single semi-floating leaf spring. In the model the Oldham coupling is built up using angle girders attached to bush wheels and mounted on the shafts, the central member consisting of two "channels" of two girders at right angles. The valve spring is a flexible strip extended by one fish-plate, and the cam employs a "fan" of fishplates as the nose, sandwiched between two small bush wheels. The rockers have rollers bearing on the cam, and the handrail supports which operate the valve stems are adjustable for clearance. To fully appreciate the ingenuity and complexity of Christopher’s model you really need to spend a little time watching it at work. 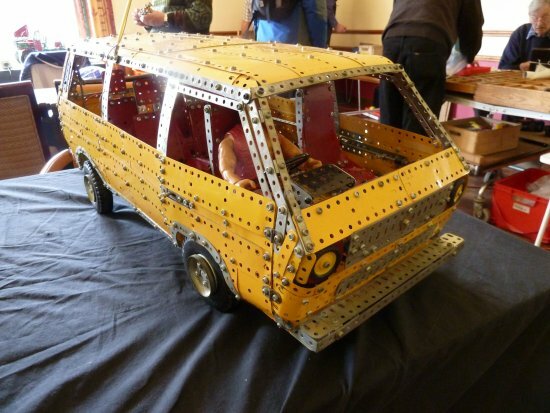 I am sure Frank Hornby would have been impressed by this application of Meccano! 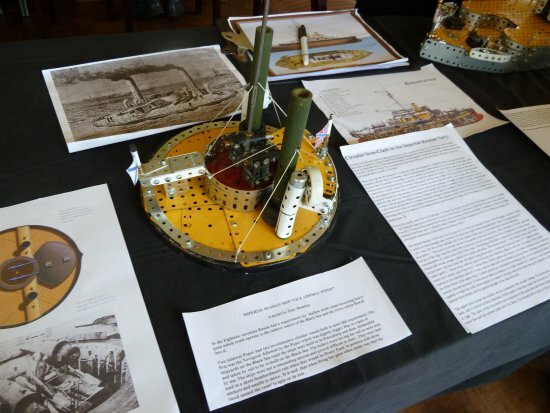 The ship models that then hove into view comprised a most interesting pair of late Victorian battleships constructed by Tony Homden. The first model was of the Imperial Russian Ship “Vice Admiral Popov” which is quite unusual since it has an entirely circular planform and the guns are mounted in a central fixed turret. The model is quite small having a diameter of approximately 8~9”. Tony’s note explains that the unusual design resulted from a Russian requirement in the 1870’s for a shallow draft vessel mounting heavy guns which could operate in the inshore waters of the Black Sea. Two circular vessels were built to this requirement, the first being the Novgorod followed by the Popov, which was slightly bigger. Both ships owe their circular layout to the American Monitor design used in the civil war. The ships were not a resounding success and proved difficult to steer – it would appear that they had no directional stability! It is said that when firing the guns whilst underway, the recoil caused the vessel to spin on its axis. Tony’s second, and rather more substantial model was of the British battleship HMS Devastation. Devastation was launched in 1871 and was one of the first of a radical new design of battleship built without sails. The ship was highly controversial at the time, especially among the old diehards who believed that the superiority of the British Navy lay in its sail drill. The ship was in fact a very successful design. With a low freeboard, heavy armour and two revolving gun turrets she set the style for battleships for many years to come. Previously, battleships had their main armament firing broadsides from fixed positions, very much as in Nelson's day. The new layout in which revolving gun turrets on a raft like low freeboard hull was also derived from the American Monitor designs of the Civil War. Devastation was originally fitted with four twelve inch muzzle loading guns. She was later refitted with ten inch breech loaders which had double the range of the old guns and could be fired four times as fast. She served in the Mediterranean and the Channel Fleet for many years and was finally broken up in 1908. 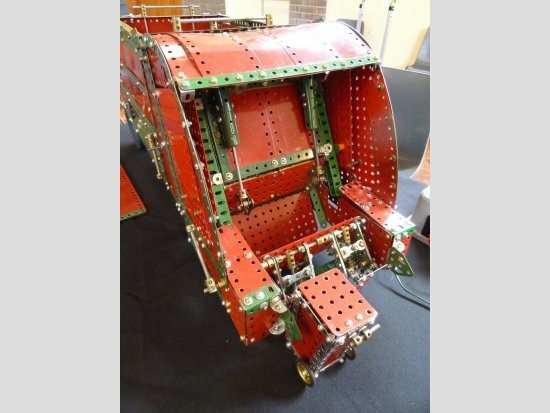 Construction of the model in Meccano was quite straightforward, the decision having been taken to make this a waterline model. The main hull and superstructure are made from "silver" plates on a girder frame backing. The two gun turrets revolve from straight ahead to ninety degrees on the starboard beam. A PDU drives a cam fitted under the front turret which overcomes the need to reverse the motor, while a simple bevel gear drive connects the rear turret to the front one. There is a full complement of ships boats, both on davits and stored on the boat deck. White metal strips being largely used in their construction. Warships of this period housed their anchors on deck with the anchor chains running forward through a hawse pipe and then back to the capstans. 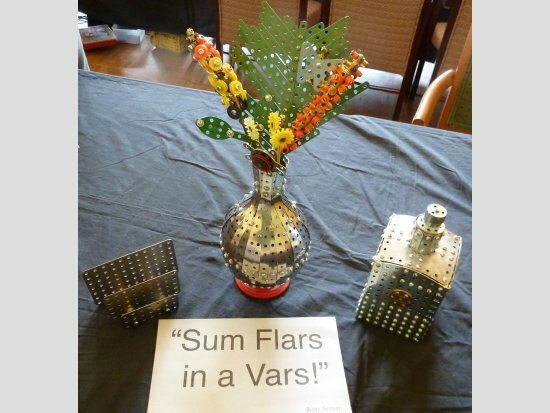 This arrangement is represented using Meccano chain. The indented part of the superstructure at the stern was known as the cul-de-sac and was intended to give some natural light to the officers’ cabins that were situated inboard. I am especially indebted to Tony for providing me with the informative notes on both models. The irrepressible Alan Covel has done it again! He brought along yet another original very large scale model, this time of Stephenson’s Rocket locomotive dating from 1829. At approximately one third scale this is a big model. Very nicely made as ever using his customary pristine yellow, blue and zinc parts, the model measured up at approximately 53” long, 30” wide and over 5ft high to the top of the chimney! As usual Alan’s choice of wheels set the scale. 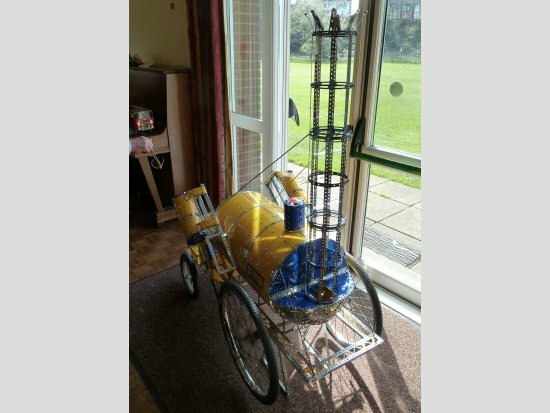 The front wheels were recycled from a wheel chair and the rear wheels were smaller pram wheels, but of a very similar compatible style. Alan’s models always have a colourful presence, but the Rocket was unmissable simply due to its size and its proximity to the doors to the lawn outside. Whatever next I wonder? Paul Brecknell confessed that he has been rather too busy lately and his Meccano model building has had to take a back seat. Never the less he did bring several constructions to the meeting being the initial stages of what promises to be an interesting excavator model. 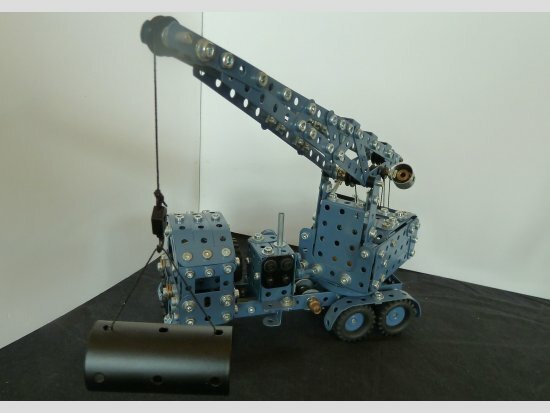 The items on show comprised the crawler chassis with turn table, initial work on the gearbox and a trial construction of the jib racking mechanism. So, we can look forward with anticipation to the development of this model. Then next door I came to my good friend Colin Reid who, as always, brought along an interesting collection of Meccano items most of which had been secured at auctions for enviable prices. 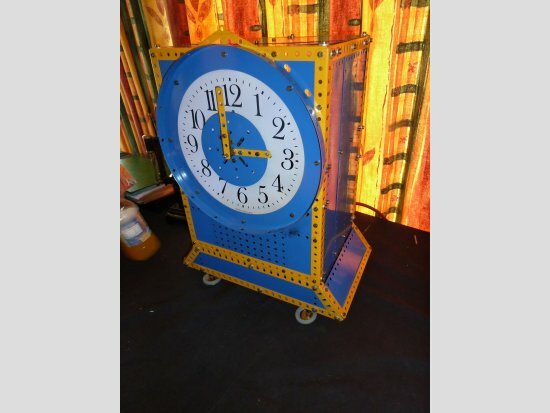 Of particular interest among his many bits and pieces, Colin displayed a rather nice synchronous mantle clock in a prominent position together with a nice example of a Märklin vertical steam engine. 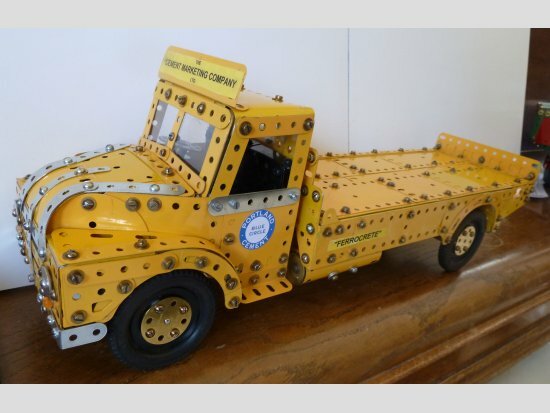 Other auction acquisitions included some boxes crammed full of mint Meccano parts – the box I had a good look at contained a very large number of yellow girders in all of the shorter lengths up to about 9½”. A really nice find for the serious model builders, you just have to know where to look! 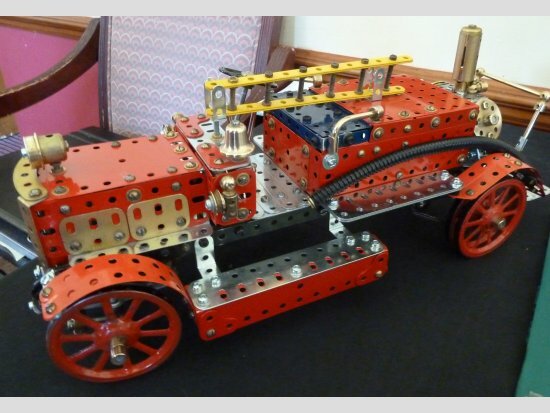 For some years now I have been reporting on Mark Rolson’s Meccano vehicle models, and every time he manages to create something bigger, better, more colourful or just more interesting than before. I thought his current model, which was not quite finished, was an especially interesting variation on the theme. The model is of an articulated coal wagon, which featured in MM for September 1965 I think. 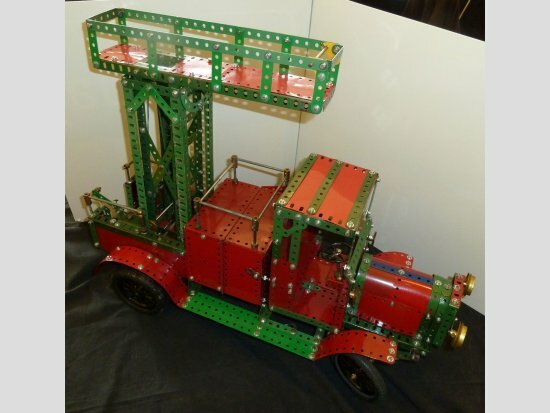 This model is an unusual and very attractive prototype, especially as Mark’s build made full use of pristine red and green coloured parts contemporary with the period. Mark explained that he had made some modifications to the mechanical detail in order to improve the model running. For those searching for something a bit different to build have a look at this model. Mark is also a bit of a salesman! What every Meccano parts restorer needs is a tube of “Peek” which, of course, Mark will be happy to sell to him. It does work, and it appears to work well. It can be used on jaded zinc, nickel and brass parts to bring them back to a very presentable condition as Mark showed me. The procedure is to immerse the parts in a vinegar solution to remove the worst tarnish, then to rinse and finally to polish with a spot of Peek. It works really well on oxidised modern zinc parts which seem to be readily obtained at boot sales and the like. 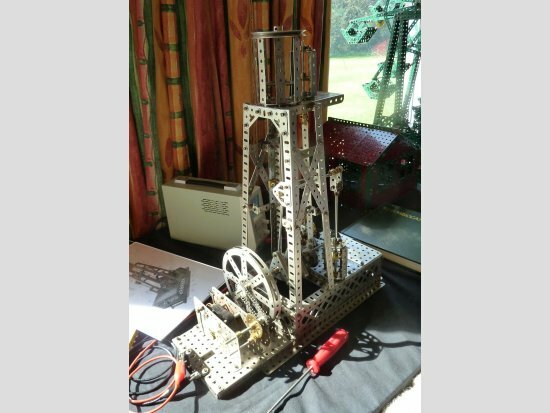 After all that excitement I found myself looking at a really nice model of a vertical steam engine brought along by Hamish Ross. The entire model was built entirely from 1920’s nickel parts from the instructions for Model No.614 in the 1926 manual. The model was powered for demonstration purposes by a contemporary 4 volt nickel side plate motor. Since all of the nickel and brass parts are in very good condition the overall presentation was very attractive indeed. Unfortunately the model was not running, but I was assured by Hamish that it does work very well – that is until the motor developed some kind of electrical fault. In keeping with the 1920’s theme, the next model was SML33a Double Flyboats built by John Nuttall. 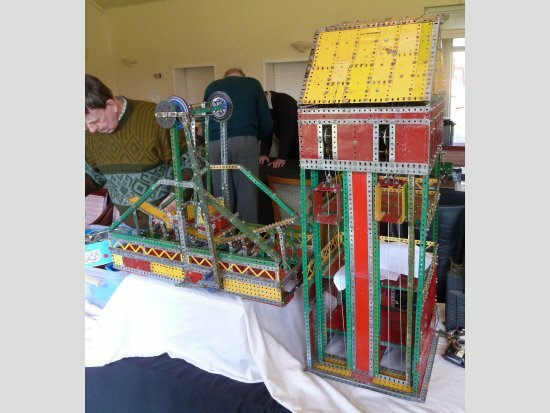 This is an imposing model at the best of times but John’s model was especially eye catching as it was built using late 1920’s red and green coloured parts, all of which are still in very good condition. The model was modified for display purposes to be operated by a mechanical indexing unit, housed separately alongside. The unit causes the wheels to stop with a pair of cars at the bottom for loading and unloading. After a short pause it indexes the wheels one eighth of a turn to bring the next pair of cars to the bottom and then pauses again for loading and unloading. This repeats until all eight pairs of cars have paused at the bottom. It then runs continuously for five full turns, after which the indexing sequence is repeated. The last model on my personal tour was a large Scammel tractor unit built by Geoff Burgess. The model was built to the familiar pattern, the scale being determined by the choice of very large tyres, and Geoff made no secret of the fact that he had borrowed lots of ideas from various other builders of similar models. The effort was repaid with a nice clean model, resplendent in shiny new red and green colours and bristling with the usual mechanical detail. It was interesting to learn that most of the parts used had been reclaimed and restored from old derelict stock. And that was pretty much “it”. However, my apologies to Mick Burgess who left with his models before I had the chance to catch up with him. My apologies also to Jim Gamble who, according to the meeting return, brought along a model of a vintage style bus designed by the late Chris Beckett. I missed this model too, probably not paying attention, but building instructions can be found in a recent edition of the NMMG Newsmag. It was good to see our resident traders again, John and Linda Thorpe and Mike Rhoades who still manage to provide the essential supplies to the fraternity. What would we do without them? Probably for the first time ever, I did not acquire any new stuff at this meeting and have regretted that since arriving back home. The moral of that story is that you should buy it when you see it as you probably will not find it when you need it! As always, Bob Thompson was very busy throughout the meeting seeking out photographic material from those who have pictorial records of meetings long gone. He informed me that the collection now exceeds 7,000 photographs and continues to grow. His project has now taken on the status of a pictorial history of MMG and it can be accessed from the Guild website. Once again, many thanks to those members who gave me some written information about their models, it really does make reporting easier and I hope that it makes for a more interesting report for my readers.